· 250g eggs beaten (5 medium eggs). For the pastry cream. Place the egg yolks in a bowl with the sugar and corn flour whisking until combined. In a medium sauce pan pour in the milk and baileys and bring to a simmer. Pour over the eggs and sugar stirring until combined, pass through a fine sieve. Pour mixture into the pan and cook on a low heat for 3 - 5 minutes continuously whisk the pastry cream. Remove from heat and transfer to a bowl, directly place cling film on top of the pastry cream and chill in the fridge. For the choux. Sift the flour. In a large pan put the water, milk, sugar, butter and salt. Bring to the simmer, lower the heat, add in the flour and beat it in with a wooden spoon until the mixture forms a smooth dough. Cook for a minute until the paste comes together and comes away from the pan. Allow to cool for 10 minutes. Beat in the eggs a little at a time, stir vigorously until completely combined, the dough should appear smooth, glossy and hold its form. Remember you may not need to use all of the egg so do the V test before adding the full 250g. The dough should drop reluctantly from the spoon in the shape of a V.
Pre heat the oven to 200C/fan180C/gas 6. Spoon the choux pastry into a piping bag fitted with a 12mm round nozzle, line two baking trays with baking parchment sticking down with a small amount of dough in each corner. Pipe 36 - 15mm round balls, leaving a space between each one. Gently smooth down dough with a pastry brush dipped in a little water to get rid of the peaks. Place the tray or trays in the oven and bake for 25 minutes then reduce temperature to 160C/fan140C and dry out for a further 10 minutes. Place on a wire rack to cool. For the sauce. Break chocolate into small pieces. In a saucepan bring the cream to the simmer reduce to a low heat and then add the chocolate, stir until melted. Take off the heat and allow to cool. Assembling the tower. Once the profiteroles are cool. With a skewer poke holes in the bottom of each bun. Next pour the double cream into a bowl and whisk to soft peaks with an electric mixer. Take the cool pastry cream from the fridge place in a bowl and stir until smooth. Fold through a third of the cream, once combined fold in the remaining cream. Place a smaller round piping nozzle in Spoon into a piping bag a cut a small hole in the bottom. To assemble. Make a tower of profiteroles on a serving plate, drizzle with the white chocolate sauce and the caramel sauce as you are building the tower. Chill the tower for 10 minutes. Place Maltesers in a bowl lightly coat with spray oil, in a separate bowl add some glitter and then evenly coat Maltesers. Next decorate the profiterole tower and then serve the dessert. 1 hour plus 3 hours chilling. First make the base – Line the base of the tin with baking parchment and lightly grease the sides of the tin with oil. In a food processor blend the almonds, dates until they have broken down in small pieces. Add the coconut oil and maple syrup blitz until combined. Press down the mixture with the back of a spoon until smooth and level. Next make the ganache, place the chocolate in a bowl. In a sauce pan bring the Baileys Almande and maple syrup to the simmer, pour over the chocolate and stir together until smooth, allow to cool. In a food processor blend the avocados until smooth and then add the ganache, pulse until smooth. Pour mixture into the tin and place in the fridge and allow to set for 3 hours. Once set carefully remove the chocolate cake from the tin. Return to the fridge. To make the shards. Turn a small baking tray upside down and line with baking parchment. In a bowl melt the chocolate over a pan of barely simmering water. Frist decorate the top of the chocolate cake. Dip a teaspoon in the chocolate and drizzle over the ganache cake, creating chocolate swirls on the top. Then pour the remaining chocolate onto the parchment, evenly spread to the edges of the tray with a step pallet knife, sprinkle half the chopped almonds and bronze crunch. Place another piece of baking parchment over the top of the chocolate and place a chopping board on top, this will keep the sheet flat. Set in the fridge for 20 minutes. To serve, remove the baking parchment from the base. Place on a cake stand, decorated with the remaining toasted almonds and bronze crunch. Gently brake the chocolate sheet in piece and on one side of the cake push the shards into the ganache a little they stand up and serve. 1. Place the milk and cream in a saucepan over a medium heat. Whilst this is warming combine the sugar, skimmed milk powder and cornstarch together in a measuring jug and mix well. 2. Using a probe thermometer measure the temperature of the milk and cream and when it reaches 40 degrees add the sugar, skimmed milk powder and cornstarch mix. Whisk together and stir continuously with a silicone spatula until the batch reaches 85 degrees. 3. Fill the sink up with ice and cold water to create an ice bath. When the mix has reached 85 degrees plunge the saucepan into the ice bath immediately and stir occasionally. You need to bring the temperature of the mix down to 10 degrees within 30 minutes. 4. When cooled place the mix in a sealed container. Add the baileys and blitz with a hand blender. Place in the fridge for at least 4 hours but preferably overnight. 5. After ageing you are now ready to churn your batch into gelato. Blitz with a hand blender and pour into your ice cream machine and churn until frozen. 6. Scoop your freshly churned gelato into a container and cover with wax paper and a tight fitting lid. Place in the freezer. Ingredients: 200g Plain flour, 30g Cocoa power, 150g Light brown, 150g Butter (room temperature), 1 Whole egg, 1 tsp Bicarbonate of soda, 2 generous pinch of sea salt, 50g Milk chocolate, 150g Dark chocolate, 8 scoops of Baileys ice cream. 1. Place 100g of the chocolate with the butter in a bowl and melt over a pan of simmering water. Allow to cool, stir the sugar and egg. Sieve together the flour, cocoa powder and bicarbonate of soda. Fold into the chocolate mix add the salt, stir until combined. Chill in the fridge for 30 minutes. 2. Preheat the oven to 180/ gas mark 5. Roughly chop the chocolate. Line two baking trays with baking parchment. Divide the cookie dough in 18 even pieces, roughly roll the dough into balls. Gently press down the dough and then place some pieces of chocolate on top of each cookie. Bake for 8-10 minutes. 3. Allow the cookies to cool for a few moments on the tray and then carefully remove and allow to cool on a wire rack. Once cool place the cookies on a plate and add a generous scoop of ice cream, place another cookie on top and serve immediately. 1 hour 30 minutes plus 3-4hrs cooling and setting time. · First make the caramel. Pour the cream into a sauce pan and bring to the boil, take off the heat and set aside. Place a thick based saucepan on a medium heat, allowing it to warm up for a moment. Sprinkle in a couple of table spoons of sugar, allow it to melt, this will be the base of your caramel. Continue to add the sugar a tbsp. at a time allowing to melt fully before adding the next one. You are looking for a nice amber colour. Take off the heat, gradually stir in the cream, be very careful as it will bubble up so stand back. Add in the butter and stir until fully incorporated. Allow to cool before adding the Baileys. Cover the bowl and leave the caramel to set in a cool place for a couple of hours. · Prepare your chocolate moulds, make sure they are clean and dry. Finely chop the dark chocolate with a serrated knife. In a medium stainless steel bowl melt two thirds of the chocolate over a sauce pan of barely simmering water. Once the chocolate has melted take off the heat and add the remaining third, stir occasionally until the chocolate has melted. · Spoon in the chocolate to each cavity filling to the top. Tap the mould to remove any air bubbles allow to sit for a few moments and then tip the excess chocolate back into the bowl. You are looking to have a shell about 3mm thick. Cover the chocolate mould with a piece of parchment paper, place on a baking tray and put in the fridge for 15 minutes. If the shells are too thin you can paint more chocolate onto the set shell to give an extra layer. · Spoon in the caramel, try to be as neat as possible. Fill just below the top so you have room to seal in the caramel. Re-warm the chocolate taking off the heat before it has completely melted, stir occasionally until there are no lumps. Seal one egg at a time by placing a teaspoon of liquid chocolate and with a pallet knife smooth to the edges. To set the chocolate place in the fridge for a few moments. Once set turn the mould over so the bases face down and remove the eggs. If you want to make whole eggs place a some of chocolate on the one half and gently place another half on top and allow to set before carefully removing from the mould. To decorate use the paint brush and flick the edible paint across the top of the egg. · If the above technique is too technical a great alternative is to buy some hollow eggs to fill. With a hot dry knife carefully cut each egg in half. Line an egg box with some kitchen paper in each cavity, this will make it easier to assemble them. Fill with caramel and seal with melted chocolate and decorate with the edible paint. Top Tips – If the chocolate gets to thick when making the eggs re warm a little so it become fluid again. · First soak the cashew nuts over night in cold water or pour over boiling water and allow them to sit for 1hr. Rinse and drain well. · Next make the base – In a food processor blend the almonds, dates until they have broken down in small pieces. Add the coconut butter and maple syrup blitz until combined. Line the base of the tin with baking parchment and lightly grease the sides of the tin with oil. Press down the base mixture with the back of a spoon until smooth and level. · For the filling – Using the food processor add the cashew nuts, raspberries, maple syrup, Baileys Almande and coconut oil, blitz until smooth. Pour mixture into the tin and place in the freezer overnight to set. · To serve carefully remove the cheese cake from the tin. Remove the baking parchment from the base. Place on a cake stand, decorated with bronze coated almonds, fresh raspberries, freeze dried raspberry and rose petals. Allow to sit for 20 minutes before serving. Top Tips – If the white chocolate gets to thick when dipping, warm a little so it becomes fluid again. 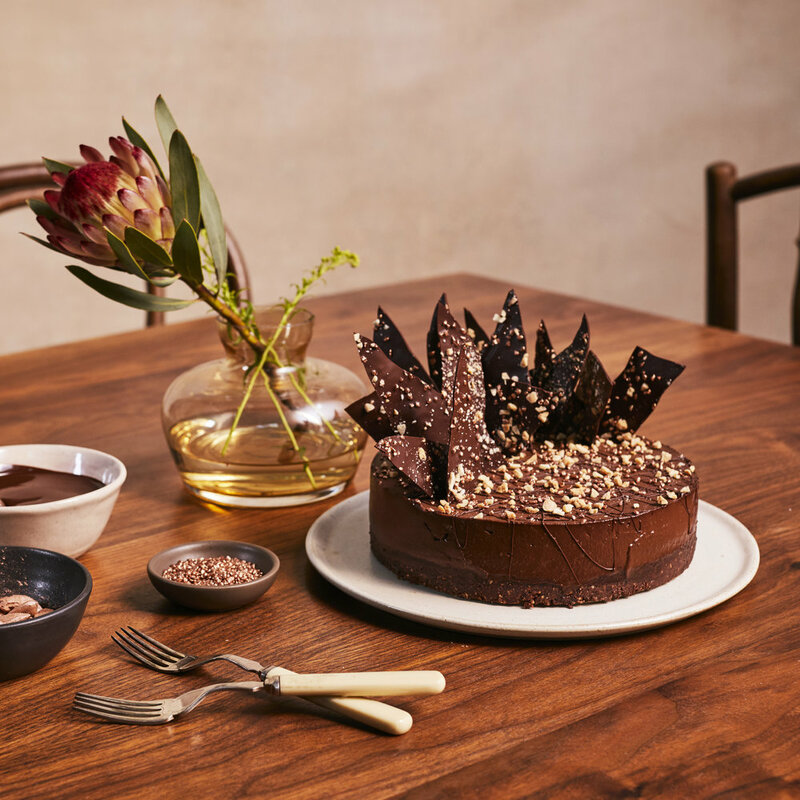 The Treat Collective is led by highly acclaimed artisan baker to the stars, Lily Vanilli and comprises of mixologist and founder of Rita’s Missy Flynn, award-winning chocolatier Lucie Bennett, ice cream supremo Sophia Brothers and leading barista Celeste Wong. This talented troupe has been hand selected by Baileys who will join forces to deliver the ultimate collection of tasty, grown-up treats. In a medium bowl sieve all the dry ingredients together. Weigh the butter, black treacle and golden syrup into a sauce pan and melt over a medium heat. Weigh the milk into a jug and then add the beaten egg, combine with the butter syrup mix gradually whisk into the dry ingredients. Stir batter until smooth and add grated ginger. Pour into the loaf tin and bake for approx. 30 - 40 minutes may vary depending on fan or gas oven. The cake should bounce back when touched or insert a skewer into the centre, which should come out clean. Set aside to cool on a wire rack. Once the cake has cooled cut the sponge into small 2cm cubes. Weigh cream in a medium bowl and whisk until soft peaks form. In a separate bowl beat back the puree until smooth. Add the icing sugar to taste and add the pumpkin spice. Fold third of the cream into the puree mix and the combine the remaining cream and puree mix fold until combined. Cover and place in the fridge until required. Make a fresh batch of espresso pour in to a medium saucepan and then add the sugar. Stir in the sugar until dissolved. Reduce the syrup to half the amount over a medium heat. You should have thick sugar syrup. If it is a little thin continue to reduce. Set aside and allow to the syrup to cool. Weigh the cream into a pan and then bring to the boil, remove from heat and set aside. Place a thick-based saucepan on a medium heat. Allow saucepan to become hot and then start the caramel by adding two tablespoons of sugar to the pan. Stir very occasionally to stop the caramel from burning. Allow the sugar to melt a then continue the process until you have added all the sugar. Avoid vigorously stirring as this can cause the caramel to crystallise. Once you have a medium amber colour take the caramel off the heat. Gradually add the warm cream to the caramel. Be very careful, as the caramel will bubble up. Continue stirring until all the cream is added. Lastly add the salt and stir in. Set aside and allow to cool. Place two scopes of ice cream into a glass bowl. Pipe or spoon some chestnut cream in add one more ice-cream scoops. Drizzle with coffee syrup and caramel sauce, place popcorn on top and add the chocolate decorations too. Serve as soon as you have finished decorating. Remove the chocolate from the heat, wipe the bottom of the bowl with a tea towel and then add in the last third of chocolate. Occasionally stir until the extra third has melted. The chocolate should be 31 - 32°C (working temperature. If the temperature drops bellow 31°C re warm over a ban marie to working temperature. Make sure once the chocolate has set to turn the sheet over so the chocolate side is facing down and place a baking tray on top. This will keep the sheets nice and flat. Allow the decorations to set in a cool place overnight. Use a small sheet of acetate. Dip your finger in the chocolate and then in one movement make a tick shape with your finger, pulling your finger towards you. Make more then you need. Roll the acetate up into a tube shape and place in a tall glass. This will give you a curled tick. Be careful when removing them once they are set as they are very fragile. Keep in a cool dry place until needed. By opting for a dessert table of patisseries you are treating your guests to decadent desserts which are not just visually stunning but are an explosion of flavours and textures setting your taste buds and senses into over drive. This creates an amazing buzz of excitement and makes for a epic finale to the end of your wedding meal. Wonderful chocolate truffles flavoured with delicious Baileys Pumpkin Spice coated in a crunchy layer of milk chocolate feuilletine wafer. See my recipe here. Designed by Fork & Dram. Powered by Squarespace.